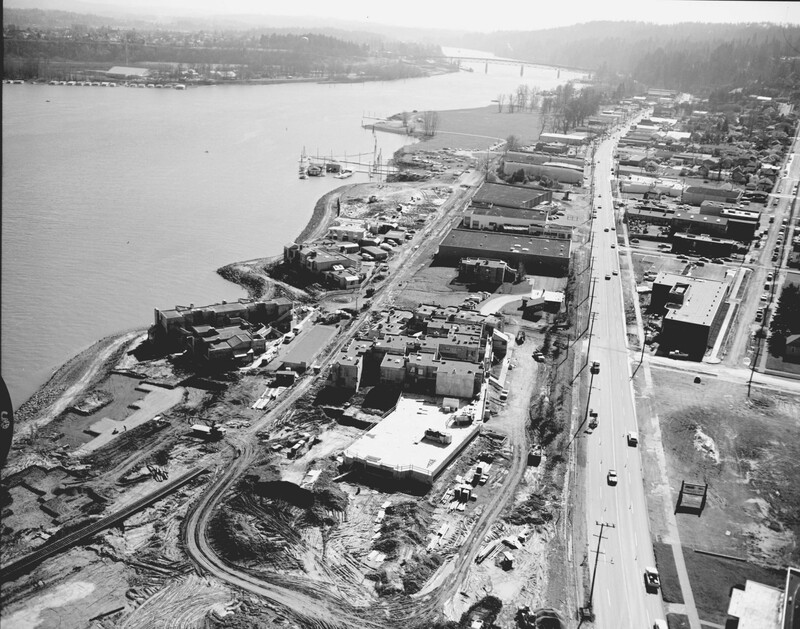 The John’s Landing area on the west bank of the Willamette River south of downtown had many riverfront lumber mills and furniture manufacturing plants at one time. It was transitioning from an industrial area to predominantly waterfront apartment, condominium and retail neighborhoods in 1975. SW Macadam Ave. is the main arterial heading south and SW Pendleton St. is the first street we see coming in from from the right. Hmmm… I always thought of this area as Fulton. The center of the old Fulton area is just to the south of the area redeveloped in the 70s and called John’s Landing, but the name Fulton has now been largely replaced in the popular mind with John’s Landing; a successful rebranding of a neighborhood, like the “Pearl District”. I don’t understand why it needed “rebranding”. There was nothing wrong with Fulton, which I still use. I also still say NW industrial area instead of (ugh) Pearl District. That’s just me though. I generally agree with you. The name “Pearl District” is so distinctly a creation of corporate marketing, rather than arising organically from the place, that it is hard to accept it. The name John’s Landing at least refers back to the B.P John Furniture facility that it replaced, but it is too bad that the name has grown to encompass the entire area, which was the town of Fulton long before B.P. John appeared on the scene. Funny… I’m 37, grew up in the Portland area, have a higher than average awareness of local history and historic names, and while I’ve heard the name Fulton in reference to Fulton Park or Fulton Pub, I had no idea until today that this area was once called Fulton. I worked at a furniture hardware plating factory called Winter’s Products Co around 1971. It was a large building about a block south of the Ross Island bridge, right on Macadam. This area was very industrial in those days and very polluted. It wouldn’t have made a good photo opportunity in those days, but I would love to see a picture of the area before John’s landing started development.